I think the starting deck is looking a lot better now. Hide is still weak at 1 cost. 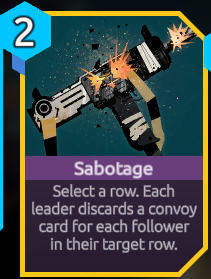 Its very hard to find useful targets for this card. Reinforce is an ok addition. It combines well with Preparation. Light Blast is a good starting card. Rally is still weak. I removed this card from my deck during my run. Disrupt is quite expensive for 2 dmg, but its still nice to have something that hits all enemies. Heavy Slug is quite good, even though it gives 2 cards to an enemy. I still don't really like this card. The decks that I run are very large. Making copies that go into the deck does not serve much of a point. Maybe someone else will have an interesting plan for it, running some small deck with power cards to copy. 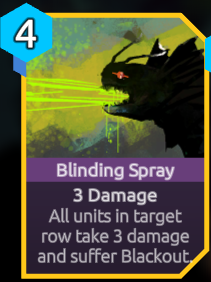 Blinding Spray is a lot better now, after the buff. The Blackout utility can also be quite useful. I like it. 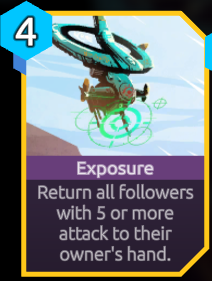 Exposure is quite strong. I like it. Still has bad wording. I have not used this card, but it looks pretty good. I'll have to test how it actually plays. 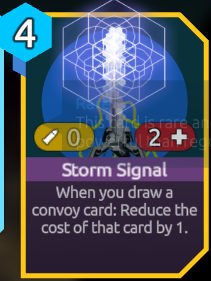 Storm Signal seems very risky card to play. I think its pretty bad. It only slowly pays for itself, unless you are drawing more cards than normal. It is a large initial investment in Momentum. My favorite of this group. It is a fun card. It makes you think about building your deck around it. In the right deck it will be strong. In the wrong deck it will not do much. This card seems weak. I guess it lets you copy legendary followers, or some other good follower. But the cost is high. 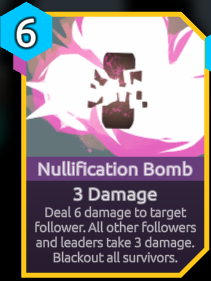 You end up paying 2 Momentum more than the follower card normally costs. Well, its a strong bomb. But probably too strong for me to use it. Hurting your leader and followers, means you can't use this bomb in any but the most dire situations. Otherwise you are just hurting yourself too much. 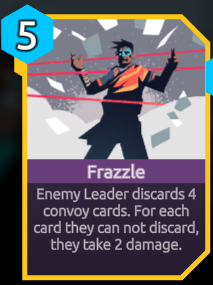 Leader dmg makes this a bad card. (at 3 dmg it doesn't clear everything) Though i guess this is your only board clear option. 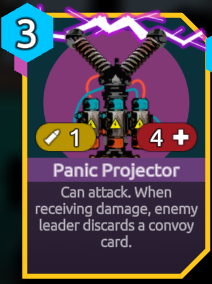 I like the Panic Projector. Its a bit of a weak drop early on. But if you already have board control then this is quite good. 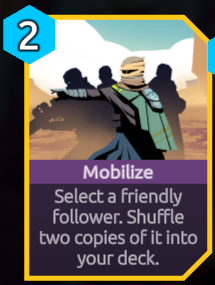 Seems like a bigger version of Mobilize. I don't see myself ever using this. The cost is very high. You need to be winning the game already to be using 5 momentum for something like this. A follower stealing card?! Awesome. Not only steals it but buffs it too. The cost is high, but it should be. 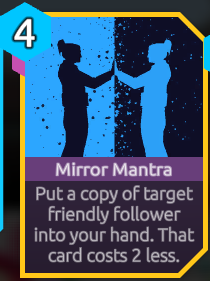 I like this card, it feels Mythic. 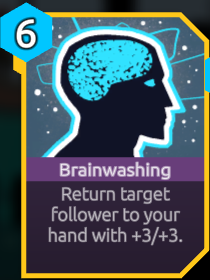 The conditions on this card make it really hard to use. It costs 5 Momentum, which is quite high. You'd have to be copying something really big for it to be worth it, and then on top of that, you would need an empty hand. It seems weak to me. That's a lot of discard. Could be quite strong. Seems good. One thing you need to be aware when it comes to copying followers: These copies don't have a name and thus don't accrue wounds. I noticed this right away when i used "Reserves". I looked to see if i could tell apart the copy and the normal card, and the name thing jumped out. For the other cards, it didn't influence my feedback much. In my 30 follower deck, the chance of drawing the shuffled cards, is very small. Pretty sure I would just finish most fights without seeing them. I'm surprised you run a 30 dude deck now. 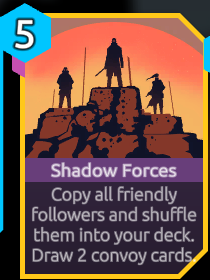 The chance of seeing shuffled-in followers increases on the longer matches and it synergizes with draw-convoy-card effects. I've been running 30 convoy decks for a long long time now. It basically happened when the # of wounds before death was changed to 1 (which was ages ago). Before that, I could run a totally static deck (the same cards could just stay in forever, and get healed at town). With a static deck I really tried to optimize it, and ran relatively small decks. Nowadays bigger decks are just better. And you make substitutions after almost every single fight. 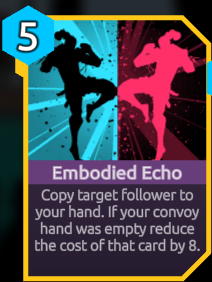 There is no point in optimizing a follower deck really hard, since you will just switch out everything that got wounded. 1. 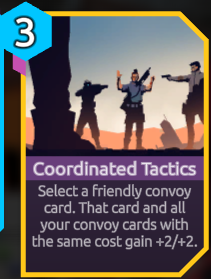 You can cycle convoy cards pretty much all you want, looking for followers that better fit the current amount of momentum. There are also many followers that I value about the same amount. Those all get subbed in for each other. If i value all my followers nearly the same amount, then I might as well put in 30. There are a couple followers that are a bit stronger than others, but not enough to really worry about. I have no special "need" to draw these followers very fast. If i don't have really important, very powerful followers, then I don't need the deck to be small. Every one of my 30 followers is "good". None of them are super amazing. I don't need to make sure i draw my "power cards" quickly. I just need to make sure i draw a follower at the start with 3 momentum cost.